These free word search puzzles can help you review important English vocabulary. Unlike crosswords, they don’t help you practice the word meanings. However, once you have learned the meanings, word searches help you focus your attention on them. They can help you practice spelling as well. The best way to use word search puzzles is along with other review of the same words, so many of the puzzles are followed by links to related reading selections or practice. The words in the puzzle run left to right, top to bottom, or diagonally, but not backwards. 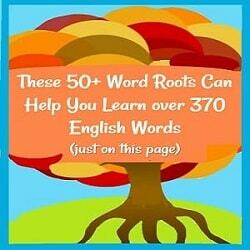 Most word searches include about 50 words, using mixed forms: nouns, verbs, adjectives and sometimes adverbs. The words to search for are listed at the bottom. If you want more of a challenge, just cover the word list until you have found all you can without that help. We use past participles after ‘have’ (or ‘had’) to form the perfect tenses. (See that page for an explanation.) Most past participles are the same as the simple past form, regular or irregular. It’s worth practicing the irregular ones, and you can do that with Irregular Past Participles Word Search and its answers. •	turbare- to trouble or cause disorder. The first two academic vocabulary word search puzzles include all the words originally in the Top 100 List of Vocabulary Words. (A few words on the list have changed as I've tried to choose THE most useful words to start with.) That page links to practice pages for each group. 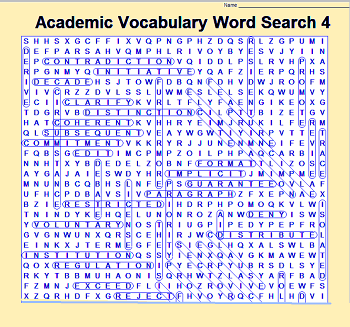 (Academic Vocabulary Word Search 1 includes list 1 and 3; Word Search 2 is for list 2 and 4. Don’t ask why they’re not in numerical order!) Answers are here for puzzle 1 and here for #2. The next two puzzles include a total of 100 more important academic word families. I don’t have practice pages for most of these words yet, but many are included in the practice pages for the top 100. Academic Voc. Word Search 4 is mostly words related to university study and life. (Answers here.) It includes academic writing terms such as cite, clause, coherent, draft, revise, and thesis, as well as institutional vocabulary like aid, annual, fees, license, regulation, restricted, role, sector, voluntary, etc. The Teamwork and Design Word Search is also old, with more unique words as well as a few from above. (Answers.) You can practice many of its words on the Product Design Vocabulary page and the page on Teamwork and Cooperation Vocabulary. You might also be interested in some crossword puzzles (to practice identifying and matching word meanings). I will be adding word searches from time to time—check back in a couple of months for more! Happy puzzle searching! 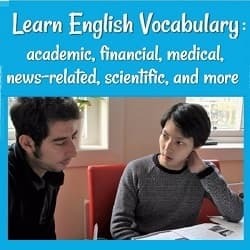 Check out all the different types of English vocabulary you can learn here-- academic, news-related, political, scientific, financial, medical, tech, psychology, art, and more !